To download the rules to Razzle Dazzle, Click Here. When we first heard rumours about an exciting new game called Razzle Dazzle we thought we'd need to put our shades on to play it. After all, with a name like that you'd expect a bit of glitz and glamour. So imagine our surprise when we clapped eyes on a no-frills wooden board game; no buzzers, no lights, no beeps - not even a few obligatory sequins! How terribly un-Firebox, we hear you yell! Thankfully, a quick go of this fast-paced game of strategy was all it took to remind us that truly great board games require none of the above, because Razzle Dazzle shines in a way only the classics, or soon to be classics, can. Besides, a glance in the dictionary reveals that the term Razzle Dazzle actually describes 'elaborate actions designed to deceive an opponent'. And that sums up the gameplay of this fiendishly compelling 2-player game to perfection. 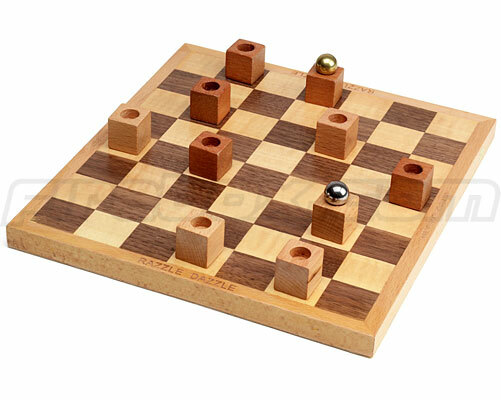 Razzle Dazzle consists of a draughts-style playing board, 10 wooden blocks (5 light and 5 dark) and two little marbles. The idea is to manoeuvre your marble to the opposite end of the board before your opponent, using your blocks to pass and obstruct. It's a bit like basketball minus the bling-clad beanpoles. Your marble can be moved in any direction, but the blocks must be moved like knights on a chessboard. With marbles being passed backward, forward, over and around, Razzle Dazzle becomes a skill-fest of offence and defence that's so addictive you'll wonder why nobody thought of the concept years ago. It feels like a classic the minute you start playing. Perfect for a quick game or a marathon matchplay session, we reckon Razzle Dazzle could soon be as well-known and adored as draughts and noughts and crosses. So go on, give 'em the old Razzle Dazzle. It won't make you a star, but it'll keep you gripped for hours on end.